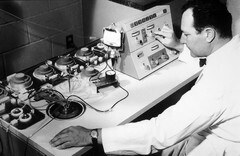 Emil Freireich, M.D., working with a blood cell separator centrifuge at M.D. Anderson Hospital. Freireich was a pioneer in the use of combination chemotherapy in the treatment of cancer. G. Terry Sharrer, Ph.d. National Museum Of American History.